Have you ever got really into a hobby – read all the books, bought all the kit, invested heaps of time honing skills – only to lose your mojo? Well, that was me and cake decorating. Around 8 years ago, I started dabbling with cake design. At first, a few novelty cakes for friends’ birthdays, off the back of these came a couple of requests for wedding cupcakes and then two years ago my piece de resistance – a four tiered wedding cake for my own wedding, covered in an estimated 10,000 tiny sugar flowers…And then I was done! The bottom tier of our wedding cake is a dummy tier. Tier 2 is a light fruit cake, tier 3 is sticky toffee and tier 4 is black forest. 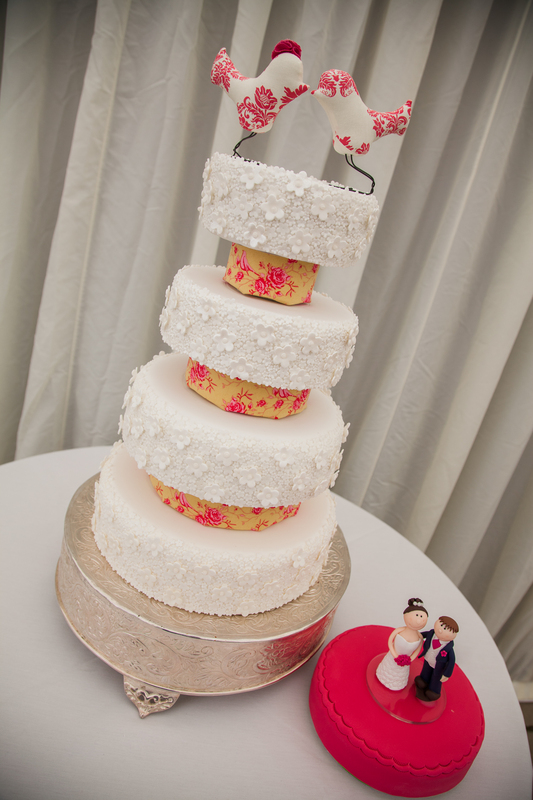 The little pink ‘Groom’s cake’ by its side is a lemon drizzle. For two long years, I have had zero inclination to either bake or decorate a cake…until now! 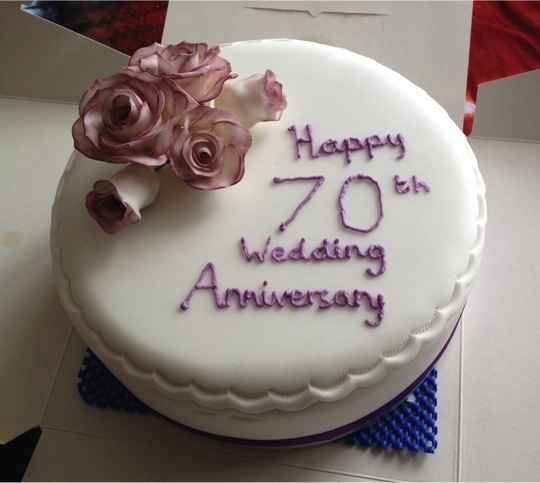 Spurred on by a very special family occasion – my dear, old grandparents celebrating their 70th wedding anniversary (in the very same month that my Nan hit the big 9-0) – I have upped tools again. Easing myself in gently, I decided some sugar roses should be the pinnacle of the cake, which was to be very old school in design. Sugar roses were what kicked off my love of cake decorating years ago, when in a very ‘monkey see, monkey do’ kind of a way I realised that it was possible to get great looking results by simply following a couple of YouTube tutorials. 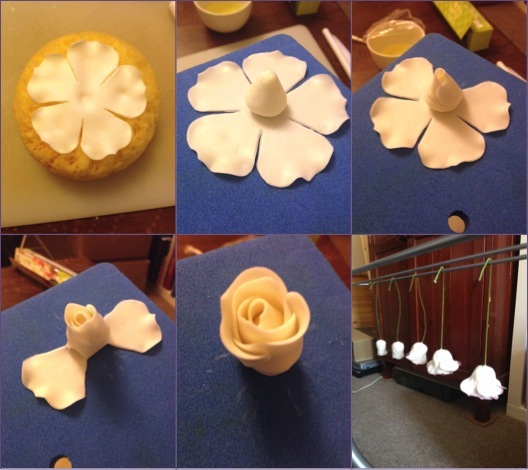 This time around, I turned to a tutorial by CakePlayGround to remind me of the process, with a view to making a small posy of 5 flowers to sit on my 8″ cake. The roses vary in size, and this is simply determined by how many petal layers are added. I do have individual rose petal cutters that I think would be very handy for the outer petals if I were to make some larger roses, but for anything up to 3 petal layers I get great results with my ‘all-in-one’ cutter, and I figure that there’s no need to make things more fiddly than absolutely necessary. Generally, advice from the powers that be on t’internet suggests that 20 gauge wire be used, but I have sooo much (non-20 gauge) wire in my stash that I worked with 18 gauge wire for the larger roses and 26 gauge wire for the smaller buds. I thought that using the thinner wire for some blooms would help me bring all of the flowers together into the final posy, but it just wasn’t strong enough really and I ended up with some floppy flower heads. Not such a problem once they were inserted into the cake, but wrapping the wires of the posy together beforehand was trickier than it needed to be. I used Sugarflair edible blossom dust in Heather to colour my roses, just gently dry brushing the colour onto the edges of my petals. 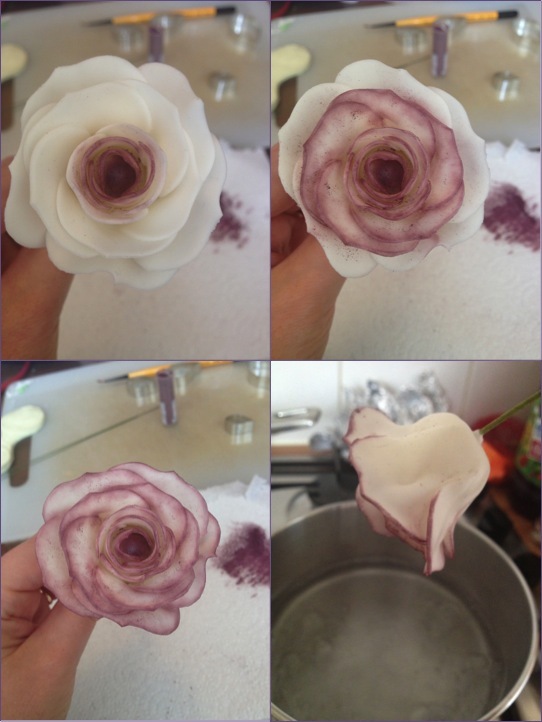 To get rid of that powdery look, I held all of the finished roses in the steam from a boiling pan of water for about 10 seconds. This bit’s like magic – suddenly the roses are all glossy and real looking. This is the part where you start smiling smugly and muttering things like “nailed it” under your breath. The cake itself is a classic fruit cake recipe by renowned High Empress of Baking, Mary Berry (love this lady!). I omitted the nuts (not popular in my family) and the fancy decoration from the top. I also took advantage of this opportunity to blast through my sugar stash. One of the tiers of our wedding cake was sticky toffee cake, and perfecting the recipe required LOTS of practice cakes with a variety of sugars – light brown, dark brown, light muscovado, dark muscovado, golden caster…the list goes on. Amazingly, the effect of the different sugars on the flavour of this cake was incredible. We went with light muscovado in the end – the resulting cake was unmistakably toffee-flavoured, but the right side of ‘treacly’. Anyway, I’d ended up with heaps of half empty packets of sugar and a mix of all of these bitty bits of sugar were poured into this cake. I was able to throw away four empty packets in total. One small warning – this recipe is not for those who are pressed for time. This one finally came out of the oven at 1am, after spending 5 hours in there. Mr Rocket did the honours with the marzipan and icing – partly because he has the technique down to a fine art and partly because the smell of sugarpaste makes me feel a bit woozy (not ideal for a cake decorator, I know!). Afterwards, I used my crimper (best tool ever!) around the top edge. This instantly gives any cake a more finished look. 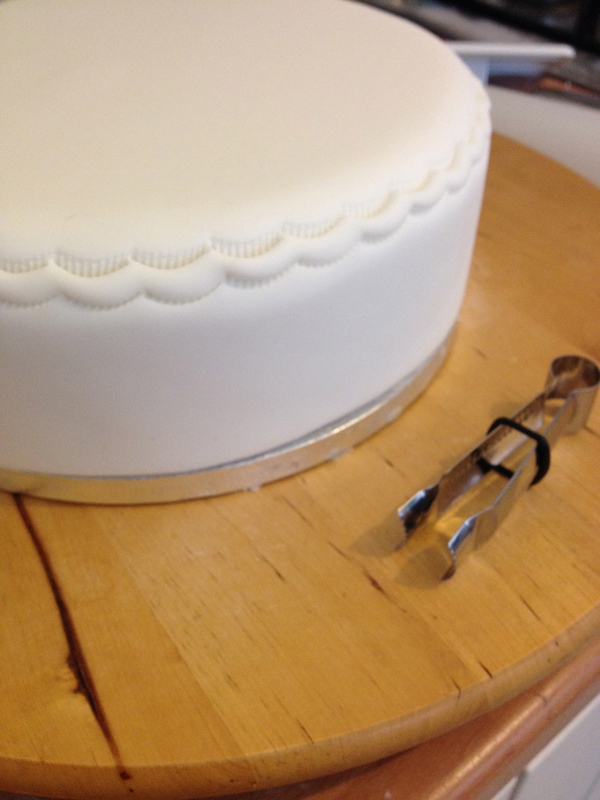 The top edge of the cake was crimped with this handy, little tool. To finish up, I popped a ribbon around the base and piped a message on the top (confession #1: the word ‘wedding’ wasn’t originally in there, but the writing was a bit skewiff and this extra word helped to even things out, confession #2: If you think my hand looks manly in this photo, it’s because Mr Rocket helped out. The writing was done last minute and despite a couple of successful practice runs, I was worried I would choke when it came to crunch time, so I bowed out and the one with steadier hands stepped up). A clever trick I’ve picked up is to always pipe any writing before placing the decorations, so there’s a chance to cover up any fluffed areas by moving things around. When I wire flowers, I usually place them in a flower pick before inserting them into the cake, but I couldn’t find any in my stash, so I improvised. First, I tried a straw, but when the flowers were taped together the stem was too thick to fit in the straw, so instead I dipped it in melted chocolate and inserted it into the cake once the chocolate was set. There are some more sugar flowers popping up in my future – I’ll be making some to decorate my brother-in-law’s Baumkuchen wedding cake (I’m not the baker for this one). 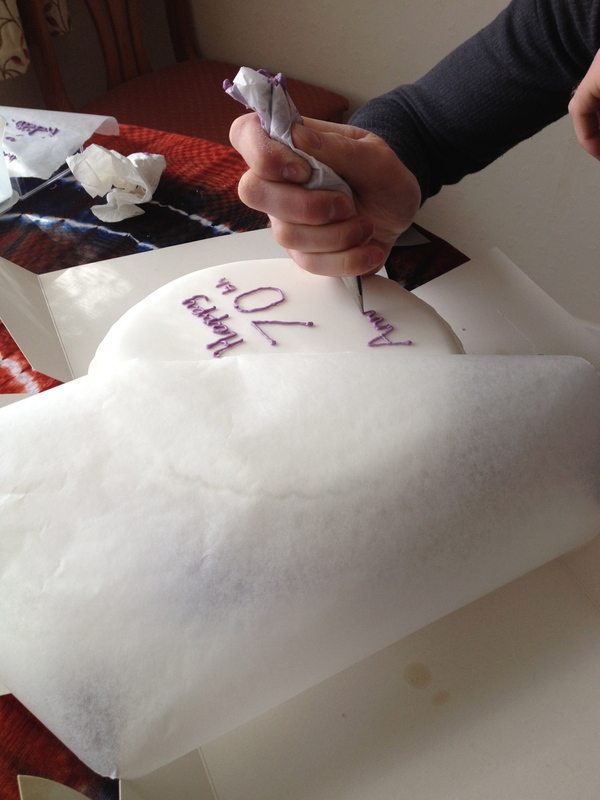 The wedding is in Germany, so I’m working on a design that can be added to the cake when I get there and that will survive the journey in an Easyjet hold. 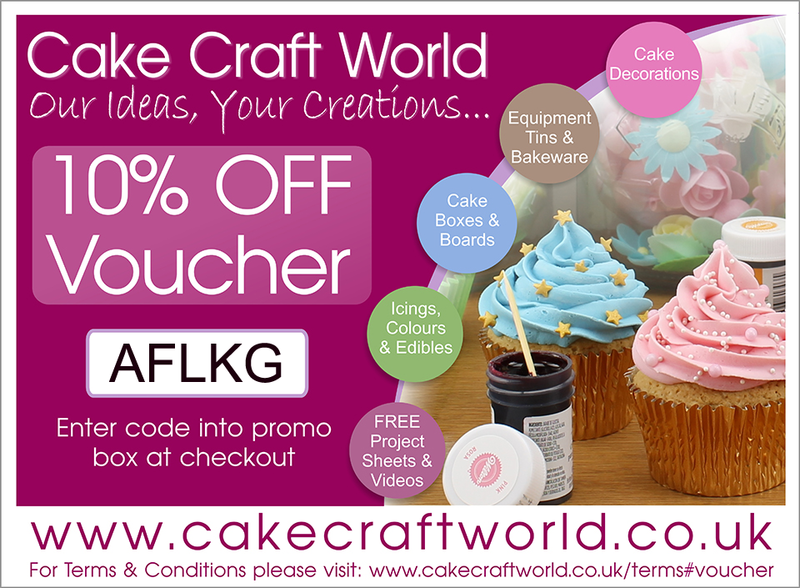 Has anyone had to transport their cake decorations internationally? Got any thoughts or tips on how to get them there safely? Next Next post: The Handmade Fair is coming!